Place the cream and garlic in a small pan and bring to a bubble. Reduce by about a third, 7-8 minutes; stir in the parm. Meanwhile, heat a large, cast iron skillet or griddle over medium-high heat. Combine the turkey with the Worcestershire, salt, pepper, grated onion and parsley and form four patties that are thinner at the center and thicker at the edges for even cooking. Cook for 10 minutes, turning once. Remove to a plate and add the butter to the pan. When the butter foams, add the hot sauce; flip the burgers in the hot sauce. 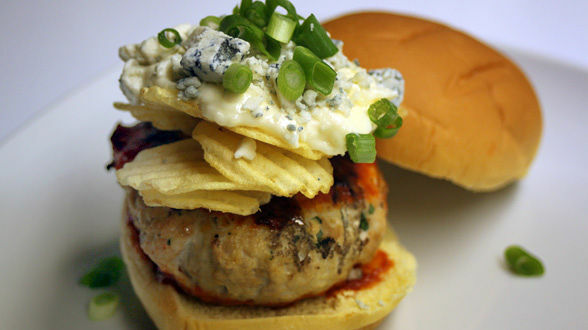 Place the burgers on the roll bottoms and top with the potato chips, cream sauce, blue cheese crumbles, green onions and roll tops. In Recipes-list.com we have selected the most viewed recipes from category - uncategorized . Enjoy the best recipes specially selected for you! Ohio Nacho Turkey Burgers is the right choice that will satisfy all your claims.